The newer version of the Jutland rangefinder - the folded pink and white card on the left. You had one for each side. The playsheet for Jutland is ready. To be fair it was merely a case of adding a few extra bits and pieces from some of the myriad of articles on the game I have access to. There are a few formatting issues to address but I will get this attended to over the next couple of days. I had previously drafted most of the playsheet back in 2013 and to be honest was pleasantly surprised to see how close to completion it was even from back then. I should point out that the playsheet only covers the tactical game and so one for the map game will need to be tackled in due course although the need is not quite so pressing. The older version (which I have) of the rangefinder which is in two halves. You can also see the movement gauges and battle area markers used to aid deployment from the map to the playing area. The only remaining problem I have - aside from punching out several sheets of counters that is - concerns the movement and turn device and the firing rangefinder. The rangefinder uses a different scale to the movement device. The rangefinder uses a scale of 20mm to 1,000 yards - a curious mix of metric and imperial measures. the movement device uses a scale of 15mm to 2 1/2 knots. I am going to settle on 1 inch equalling 1,000 yards across the board which will mean that new 'devices' for both firing and movement may be needed. I say 'may' be needed because in reality you do not really need to use the devices supplied in the game - a ruler would serve just as well. The rangefinder device quotes distances in 1,000 yard increments and also shows maximum ranges for weapons and visibility. It also shows the ranges at which hits are doubled, tripled or halved. All of these detail will be (and indeed have been) incorporated into the tactical playsheet so the only thing needed apart from a ruler marked off in inches will be a turning device of some kind. In respect of the game and its components it is becoming more and more difficult to find replacements. The game has been out of print for some years and prices on Ebay seem to get higher and higher. The rangefinder I have is from an earlier printing of the game and is thick cardboard and in two halves. 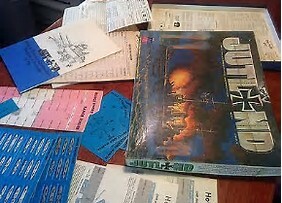 A later version was one piece of card that folded in half to fit in the box. I doubt if I will be using either device as a ruler is far more practical and having all the details on a play sheet is far more convenient. One thing I have discovered though is that our friends in the US are far better served in respect of spares for boardgames - even ones that are no longer available. the only downside is the inevitable postage and customs charges which add to the cost in some cases quite dramatically. Still, I have enough to be going with and so can use the game virtually as is. 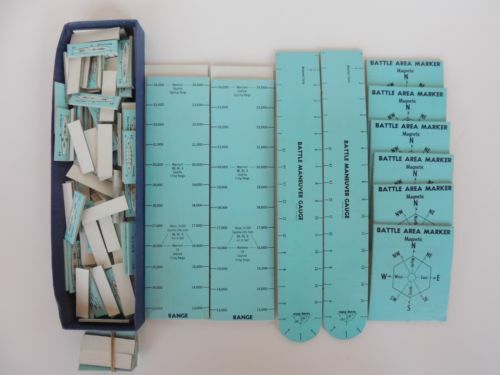 There are a few administrative details to tackle - printing ship charts being he main one - but as far as my Jutland collection is concerned we have lift off. Incidentally before I turned up with my (battered) book of GQI/II my friends was using the Jutland system to get a feel for the Bismarck/Hood encounter! 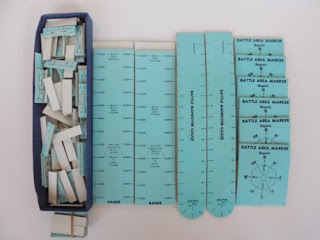 The later version of Avalon Hill’s Bismarck game had a very basic combat system for the introductory version of the game. It was brutal in the extreme!